Many people may know that clarinet players usually have to own a “pair” of clarinets (in two different keys of A and B-flat). It now seems that some professional clarinet players have been taking this “pair thing” a bit too far though. On Thursday, January 2nd 2003, my husband, clarinettist Andrew Roberts, and I celebrated the arrival of our twin girls Stephanie and Charlotte, who were born at the Liverpool Women’s Hospital. When I first discovered that I was expecting twins it was during the 2002 Clarinet Summer School held in Liverpool, and in 2003 the Summer School hit twin news as all three tutors on the course are proud parents of twins (Nicholas Cox, principal clarinet of the Royal Liverpool Philharmonic Orchestra, and principal clarinet of the Welsh National Opera orchestra, Leslie Craven). From this I learnt that there is a spookily high number of clarinettists with twins – so would-be partners to clarinettists beware! 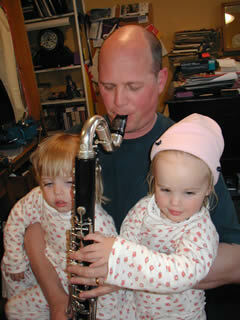 Several other clarinet players in the profession either have or are twins. These include Colin Bradbury (ex-BBC Symphony Orchestra principal clarinet) whose son John Bradbury (principal of BBC Philharmonic) is a twin, London-based David Fuest has twins, Damaris Wollen (BBC Symphony Orchestra) gave birth to twins in 2002 and professional Graham Quilter has twin boys. We think that this is above average for multiple births in a certain profession and leading us to think that clarinet players like to have more than just their clarinets in pairs. Are there any other twin clarinet links out there that we do not know about? While deciding on names, we referred to the blobs on the scan photos as “A & B-flat”, as one twins was slightly longer just like the A clarinet. We have not yet tried to forge any further links with clarinet playing, such as using a pull-through as a dribble cloths or putting mouthpieces on bottles instead of teats to encourage early embouchure formation. Stephanie makes noises that are sometimes rather like a clarinet squeak, however, both appear to enjoy listening to the clarinet and bass clarinet being played by Daddy. I am not sure what will happen when the little high-pitched E-flat comes out …. Coincidentally, while the twins were being born, Channel Five was showing a film called Twin Sisters. As fortune would have it, they were also the first twins of 2003 born in Liverpool so they even made it to the Liverpool Echo, which included a cheesy photo of Dad serenading the babies in the Neonatal Unit. To save time and expense of writing to everyone when they were born we discovered a quick and effective way to keep everyone in touch was to set up a page on Andrew’s website www.theclarinet.co.uk under a family news section – this is a great tip for parents who become overwhelmed by trying to keep in touch with friends and family around the world. Congratulations and best wishes to Fiona Cross, as she is expecting twins in October this year!